The Port of Incheon located on the midwestern coast of the Korean Peninsula has contributed greatly to the development of national economy and industries as a gateway to Seoul, the capital city of Korea. It is an artificial port with lock gate facilities which have overcome a tidal difference of 10 meters, and it is an international port equipped with various modernized harbour facilities for trade promotion with the main ports of the world. Incheon Port is truly an international gateway. Korea's second largest trade port boasts a docking capacity of 70 ships of up to 50.000 tons, and an annual cargo handling capacity of 56 million tons. In spite of the high tide differential (max. 10m), thanks to its floodgate, large vessels of up to 50.000 tons can enter and leave the port, and there is a special docking area reserved for ocean-going ships. 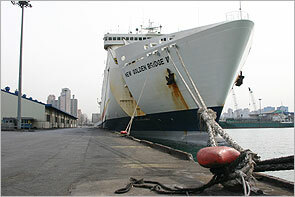 Under a project to be completed by 2011, the Northern and Southern Ports will undergo expansion and renovation so as to further increase docking capacity, while a new harbor will be created at the southern tip of "Songdo New Information City" (Songdo Inpia), to meet the city's freight and distribution needs. 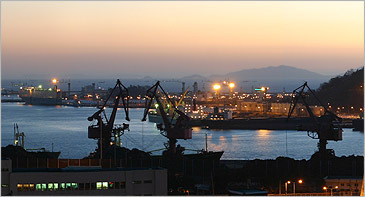 In 1883 the port was opened for ocean trade and occupied the premier position amongst other ports in the country and achieved prosperity throughout the course of the succeeding centuries. After the Second World War, however, the port had to face a serious decline in maritime transport for several decades, mainly due to the large tidal range and relative distance from the main shipping routes. These problems, however, provided the port a new challenge. In April 1966, the Government launched a massive development including construction of a closed harbour basin entered via locks to restore its access to ocean trade routes and hold pace with trends in ocean transportation. These efforts have resulted in a completion of construction of the second tidal basin in May 1974. Through its huge lock system, one of the largest and most advanced in the world, the port can now permit vessels up to 50,000DWT to berth directly in the inner harbour. This will result in a parallel development of Incheon port as a most important port for import and export of industrial products in coming days because difficulties caused by physical conditions, particularly the 10 meter tidal range, have been overcome. As a harbor city located in mid-western sea of the Korean Peninsula, Incheon is the regional strategic point in the west coast, serving the role to function as the pivotal stronghold of development in west coast area. 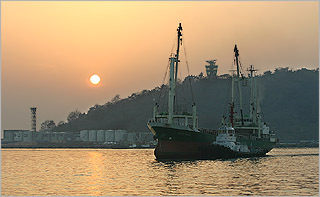 As a gateway harbor to the metropolitan area near Seoul, Incheon is the central point in coastal passenger transportation to connect islands in the West Sea. Located in the shortest distance to the mainland China, exchanges of manpower and physical distribution are being actively performed. Pivotal stronghold of marine traffic to take charge of trading between the south and the north. Coastal city filled with resources of nature as well as island tourism. The port of Incheon has berthing facilities capable of simultaneously accommodating 37 ships inclusive of 50,000 tons class ship. The container cargo volume, which crossed the port in 1994 amounted to 164,620 TEU and other general cargo of 165 million R/T being handled. The status of the vessels calling the port shows continuous increasing tendency every year. 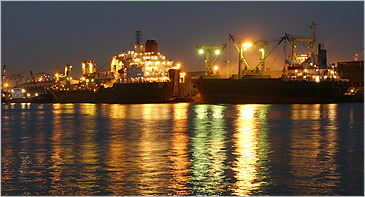 The total gross tonnage of ocean-going vessels called at this port in 1994 was 115 million G/T. The total number of ocean-going vessels called increased from 4,172 in 1984 to 9,907 in 1994 indicating an increased of 237%. From the lock gate facilities, Incheon Port is divided into the inner and outer ports, which are inside and outside of the lock gate respectively. The outer port is further divided into south port, north port, coastal port and coal wharf in terms of each location and function. Incheon Port, with the lock gate, enables entry and departure of large sized vessels to the scale of 50 thousand ton, etc. despite fluctuations in tidal level of 10m to the maximum. 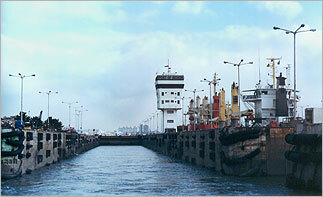 Thus, it is being operated as an exclusive harbor for outer port cargo within docks. The south port, north port and coal wharf outside of docks are mainly used to handle oils, liquid gas, coal and sand, etc., the disposition of which is difficult inside of docks. The coastal wharf is being utilized as a facility for passenger ships connecting islands in the West Sea to come alongside the quay as well as a base for fishing ships. Last year, the 1st international passenger ship harbor has been opened nearby. The facilities for ships to come alongside the quay within the docks are being divided into 8 wharves. In accordance with the plan of specialization in each wharf, major handling cargoes are being classified. Although it has been planed that wharves No. 1, 2, 3 and 6 are to be used to handle miscellaneous goods, wharves No. 4 and 5 are to be used exclusively for containers and motor vehicles, wharf No. 7 exclusively for grains and wharf No. 8 for scrap metals, complete specialization per each wharf is not being accomplished in reality. A customs-free zone is a special economic zone, which enjoys a tax privilege exempting goods traded within the designated area from custom duties and other taxes and dues, and custom clearance procedures, for greater freedom of freight trading and entrepot trading. By creating optimal logistics environments in areas around an airport or sea port, customs free zones are specially fostered to become international freight logistics bases. Incheon Port, designated as a customs-free zone in appreciation of its strategic geographic location at the heart of Northeast Asia, is quickly rising as a major logistics base at the dawn of a new Pan-Pacific Era. Most passengers waiting to board at the terminal are going to China. The ferry for China is still too huge to be called as a Ferry. The terminal is always crowded with travelers and shuttle traders. The ships located inside terminal say Korean and Chinese sign at the same time. It feels like you're in China. The ferry goes to Tianjin, Cheongdo, Daeryeon, Shanghai and Dandong. Since October of 2000, Int'l Passengers' Terminal is completed and is in operation at Yeonan Warf. Car ferries operating from Incheon Port, are currently serving 7 key Chinese destinations including Weihai, Tianjin, Qingdao, Dalian, Dandong, Shanghai and Yantai. Ferry services are also available for Jejudo Island. After the opening of Terminal I (4 stories aboveground & 1 story underground), recently International Passenger Terminal II was build up at Sinpo-dong (Hang-dong 7-ga), provided with cutting-edge facilities. The terminal has made the trip to Korea safer and more convenient than ever for Chinese and other international visitors to Korea. Subway (1-st line). From Incheon Station - bus No.28. From DongIncheon Station - bus No.12,24. From Dowon Station - bus No.14. From Jaemulpo Station - bus No.36. It takes 20-30 minutes by bus from the stations, fare - 900 won. By taxi - 15 minutes, fare - 4000-5000 won. Subway : DongIncheon Station (1-st line). Then walk on the main road from the station to sea side and don't turn off the road (you will go by Sinpo Market). Walk until meet three-sided crossroad (no way further - fence of the port only) and turn left. Go 250 m and you will see on the right gate and checkpoint of 2-nd International Passenger Terminal. You can take a taxi. I think, initial 1900 won is enough to the Terminal. The port of Incheon formed a sister port relationship with "Le Havre" (France), "Oakland" (USA), "Jeddha" (Saudi Arabia) and "Vancouver" (Canada).